Earlier in the year I read Justin Torres’ debut novel ‘We The Animals’ and one of the things that I liked about it so much was the fact that through the briefest of snap shots a while fictional world evolved which I really had to work at putting together. It felt like snapshots of someone’s life and was just beautifully written. When I saw his praising quote on the cover of ‘Lovers’ by Daniel Arsand I instantly had high expectations and when I flicked through and saw simple page long chapters I had high hopes this might be a similar success with me too and so had high expectations from the off. 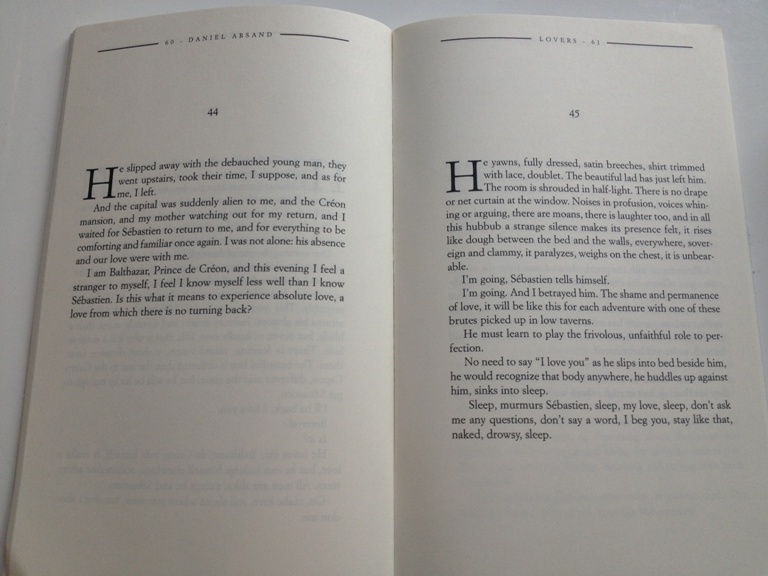 ‘Lovers’ is set in France during the reign of Louis XV in the seventeen hundreds. One day fifteen year old Sebastian witnesses a young nobleman, Bathazar de Creon, thrown from his horse. Thanks to Sebastian’s knowledge of medicines and herbs he saves Balthazar’s life and from here the start of a love story, that dare not speak its name, begins. Homosexuality was (well in some places it still is) seen as something abhorrent in the 18th century France and so when tongues start to wag around the courts scandal looks like it will ensue and destroy everything for the couple. While I have to say I thought the prose was utterly beautiful, and indeed this could really be a novella in poetry almost, in a way the novel was a bit too vague for me. I knew what was happening in the story and the sense of impending doom built up a real tension throughout, and yet something wasn’t working for me. I wondered if in being such short bursts, whilst being very impassioned and quite wrought yet beautiful, I felt like I never really got into any ones head but the storytellers and yet the storyteller was a rather dreamy and fluid narrator so when I thought I should be feeling joy, I was being told I should yet didn’t and the same when I felt I should be heart broken or devastated. I felt I should, I never quite was which was quite saddening and frustrating for me as with the prose as it stood I should have been blown away as I know others have been. I do feel for authors sometimes. We readers can be a really difficult bunch. For example I have said often enough that I like books where authors make me work hard or leave gaps in the way characters look, behave for me to fill in myself. I don’t like books where you are spoon fed everything; the descriptions are repeated over and over again just to make sure you have the exact picture in your head that the author wants, or where the research whacks you constantly over the head. With ‘Lovers’ I have discovered however that there are some books where, if too vague, whilst I might find the prose stunning leave me at a slight distance and ‘Lovers’ was a book which many will love for its poetic prose, I was just left thinking I had enjoyed but couldn’t get anything deeper from sadly. Others have, and I am rather envious of them for it because I can see it has the potential to be a hugely emotional novella just not alas for me. I ended up admiring it, but from a distance.